Are you waiting to hear from an employer after you’ve interviewed with them? You can increase your chances of being chosen for the next round of interviews – or of being offered the job – by following up professionally. This includes writing a customized thank you note. Every time you go for a job interview, ask each person you meet for their business card. This way you will know their exact names and titles and can send them an appropriate thank you. Thank you e-mail notes are fine. For that extra special touch, consider sending an actual hand written card or note. Thank you very much for taking the time to interview me on Tuesday afternoon. You gave me quite a bit of insight about your organization and were very courteous and professional. I particularly liked the way you made me feel comfortable from the start. As we discussed, my five years of experience as an Accounts Payable specialist make me an excellent choice for the position we talked about. At one point you asked if I had any additional experience that would be relevant to the job. I would like to add here that I currently serve as a volunteer Accounts Payable supervisor for a local charity. I would really welcome an opportunity to return for the next round of interviews. Please feel free to contact me at the number and e-mail address provided below. Keep your thank you’s short and sweet. 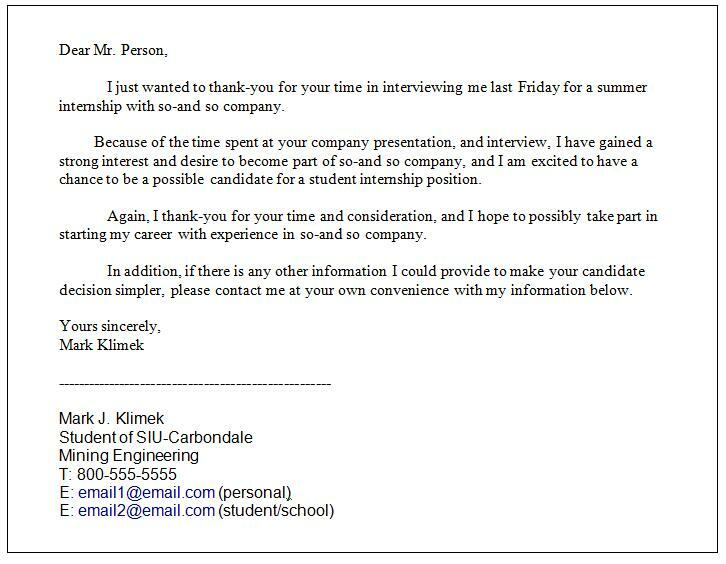 Send them around two business days after you’ve been interviewed. Then cross your fingers, keep up your job search momentum elsewhere, and hope for that thrilling call-back.